Take your pick from 9 Yellowstone Park lodging options and 12 park campgrounds. Many lodging options are also available in gateway towns that surround the park. Stay here for park lodging or discover nearby lodging. Reservations are required for staying at any park accommodations, and you should make them at least 6 to 7 months in advance as they fill up very quickly. Call 866-439-7375 to make a reservation. 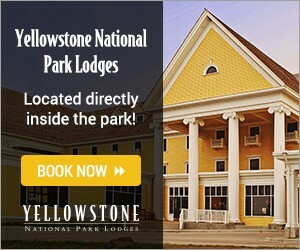 This lovely facility is located close to the Grand Canyon of the Yellowstone, and provides both lodge rooms and cabins. Canyon Lodge and Cabins is open from late May to October. Grant Village lodging complex offers 300 contemporary motel-style rooms on the southwestern shore of beautiful Yellowstone Lake. The rooms are attractively furnished with private baths and telephones. Grant Village lodging is open from late May to late September. 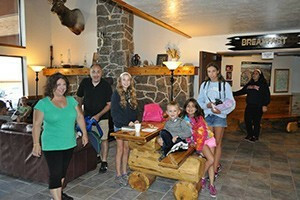 You’ll find a friendly family atmosphere at this cozy lodge with 186 rustic cabins available in the Lake Village area. There’s a large porch at the main lodge where you can sit and enjoy the views of the lake, or you can relax in the inviting lobby with its two fireplaces. These accommodations are open from early June to mid-September. This historic hotel sits on the shore of Yellowstone Lake. There are 300 rooms and cabins available for guests. This classic structure is famous in Yellowstone, and elegant furnishings make the stay extraordinary. Sit in the Sun Room and listen to the string quartet playing in the lobby. They are open from mid-May to early October. Named for the nearby hot springs running over limestone terraces, the Mammoth Hot Springs Hotel and Cabins (near the North Entrance to the park) has 212 charming units, which include two elegant suites with telephones and cable TV. This hotel is open all year with only two periods of closure, from October to mid-December and from early March to early May. This historic inn is the most popular lodging facility in Yellowstone. There are 327 rooms and suites. The building’s architecture is a rustic log-and-frame style, seven stories high. The lobby is a marvel itself, with a 65-foot ceiling and a huge fireplace, making it a virtual palace. 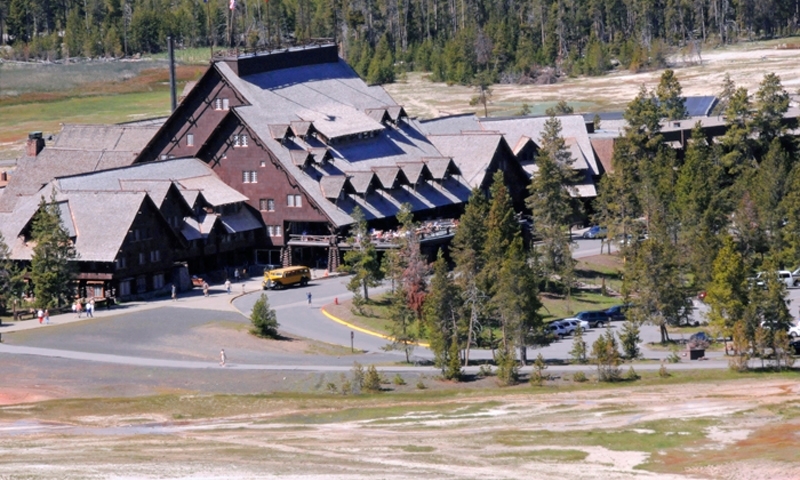 Old Faithful Inn is open from mid-May to mid-October. A massive main lodge complements this cabin facility close to Old Faithful Geyser. There are 96 cabins to choose from. These accommodations are open from mid-May to mid-September. The Old Faithful Snow Lodge and Cabins, in the Old Faithful area, is one of the newer hotels in the park. The architecture fits in wonderfully with the park surroundings, with heavy timber beams and high ceilings. Relax in the wicker furniture while enjoying the ambiance. With 134 rooms and cabins, you’ll find the perfect spot. The lodge is open all year but closed from October to mid-December and from early March to early May. When you stay at this charming stone lodge, you can relax on the porch in a comfortable rocker and soak up the natural beauty of Yellowstone, near the Tower-Roosevelt Area. There are 80 cabins to choose from, all fairly primitive with only 14 of them having private bathrooms. Roosevelt Lodge Cabins are open from June to early September. There are 12 campgrounds in the park, and they are open from May or June to September or October, except for Mammoth Campground, which is open all year. While some are available on a first come first served basis, you can reserve sites at a handful by calling 866-439-7375. The Bridge Bay Campground is close to Yellowstone Lake, two miles south of Lake Village and just a short distance from the Bridge Bay Marina. Reservations are required. Canyon Campground is only a mile from the Grand Canyon of the Yellowstone and one-quarter mile from Canyon Village in a wooded setting. Reservations are required. Find Grant Village Campground one mile from Grant Village on the southwest shore of beautiful Yellowstone Lake. Reservations are required. It’s close to the Madison River, 16 miles from Old Faithful, with 270 sites situated in the woods with lots of wildlife and terrific fishing. Reservations are required. This is an RV-only campground, located close to the Yellowstone River as it is leaving Yellowstone Lake. Reservations are required. This campground is close to Mammoth Hot Springs. All sites are first-come, first-served. Norris Campground is located 12 miles west of Canyon. All sites are first-come, first-served. Indian Creek is located 8 miles south of Mammoth Hot Springs. All sites are first-come, first-served. On the southeast shore of Lewis Lake you’ll find this campground. All sites are first-come, first-served. This is a great campground only 9 miles east of the northeast entrance to the park. All sites are first-come, first-served. On the banks of Slough Creek, five miles east of Tower Junction, this 29-site campground offers either the shade of lovely trees or an open meadow. All sites are first-come, first-served. At Tower Falls Campground, two miles south of Tower Junction, you’ll discover 32 nice campsites in a pine forest. 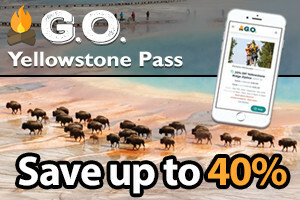 All sites are first-come, first-served. Find great places to stay in the Black Hills of South Dakota. Lodge accommodations around Glacier National Park.